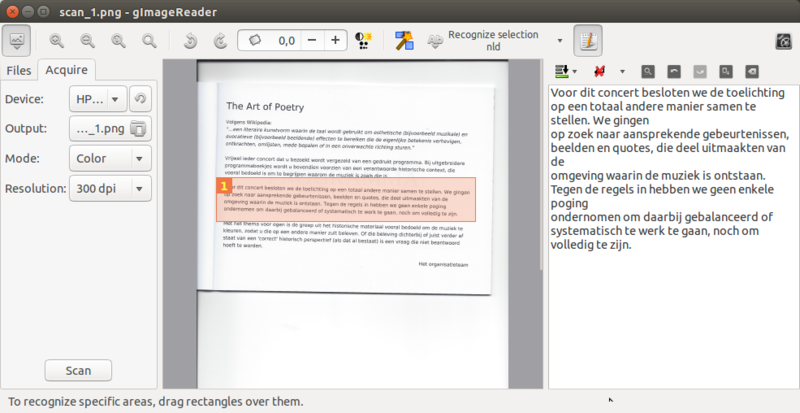 Is there a good PDF viewer in the Ubuntu sources that lets me select and copy text? Okular for KDE is a great app, as it has a far greater number of tools than Document Viewer does. I see the repos have Okular, but I would like to avoid installing all the KDE dependencies that come with it. However, all I really need to do is select and copy text from a pdf. What will allow me to do this? As mentioned in a comment, if text in a pdf document is selectable as text or not, depends on whether the text is in the document as an image or as text. In the latter case, all pdf viewers do support selecting text as far as I know. No options with text in a pdf image? You do have a few options however to make the text in a document "readable"
It has a nice interface and reads the selected text, displayed next to your pdf document. Specific languages can also easily be selected by using synaptic. (at least) From 18.04, gImageReader is in the repositories, so no need to add the ppa manually anymore. Take a look for master PDF editor. It's a great application for all tasks you could do with a PDF file. a good PDF viewer for ubuntu that supports text highlighting? How to change the text font color on multiple PDF pages at once?